On Saturday, a group of Seattle-area knitters rode the early train down to Portland for a little crawl through the Pearl District yarn shops. Bobbie helped to arrange for a few PDX Knit Bloggers to meet the train and welcome our fellow Northwest knitters to Stumptown. Since I had never been to two of the Pearl shops (what can I say – we have over 20 yarn shops and I just can’t make it to all of them all the time), I thought it would be really fun to join in. 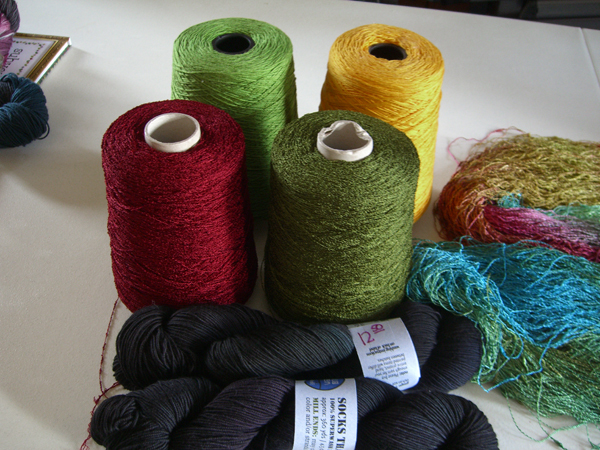 But I wasn’t going to buy any yarn, because my stash is feeling sufficient right now. I especially wasn’t going to buy any sock yarn. I wish I had snapped a picture of all of the knitters milling around the station when the train came, but user error messed my pics up. Charisa, who had spearheaded the yarn crawl, had name tags for all of us that entitled us to discounts at several of the stores, and a handout with a map and such and gave everyone last minute instructions. A very nice Amtrak employee asked me if I needed any directions or maps and what time would be all be back? He looked a little confused when I told him that I live here, but smiled and said that I thought the visitors had it all in hand. The groups split up so that we didn’t overwhelm the shops by hitting them all at once. 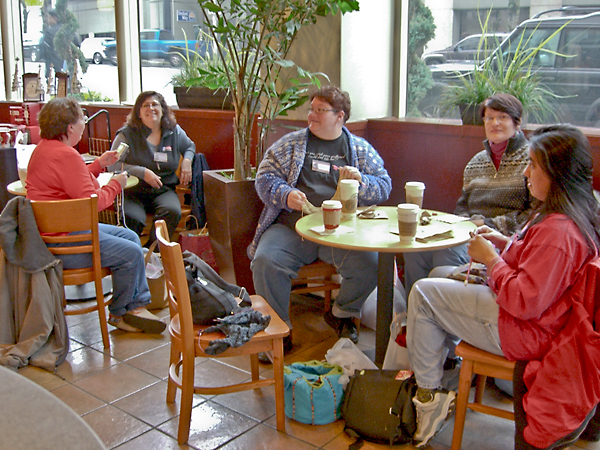 I needed to find a free place to park my car for the day, and several of the PDX Knitters joined me in the search. Our first stop was Dublin Bay, where I finally got to meet Chrissy. On a little rack towards the back of the store, I found these really cute little buttons. I have no idea what I’m going to do with them. But they’re so cute, I just had to have them. And they’re not yarn. If you’re reading this through a feedreader, go on over to the blog and pop up the picture so you can see how cute the buttons are. I’ll wait right here. As I turned from the button rack I saw a knitter clutching Zen Yarn Garden skeins. I had already ignored the siren call of Fleece Artist and Handmaiden, although I did pet a lot of yarn. All the yarn, I think. The colors of the Zen Yarn Garden were so pretty. From Dublin Bay a few of us walked down to Knit Knot Studio. 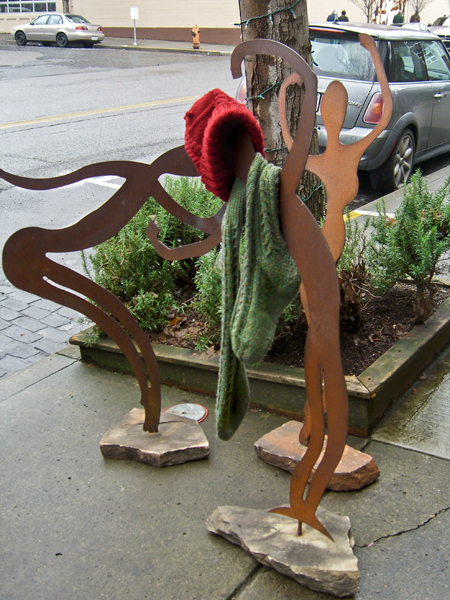 Along the way we came across these poor, cold statues dancing on the sidewalk. 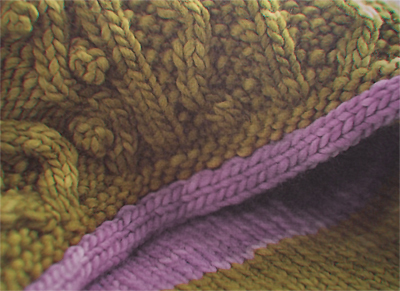 Hand knits were offered as a temporary warm-up. They looked so cold. Knit Knot Studio is a tiny but cute little yarn shop that’s packed full of really yummy things like naturally dyed silk and handspun cashmere. 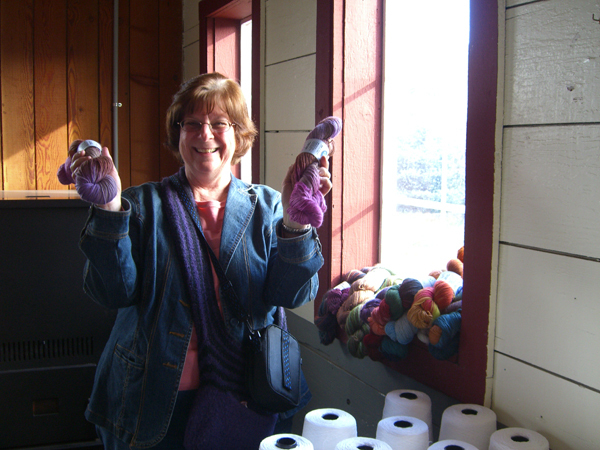 Look what I found someone said, holding a skein of Noro Kureyon Sock. I love Noro colors, but not necessarily Noro yarns. 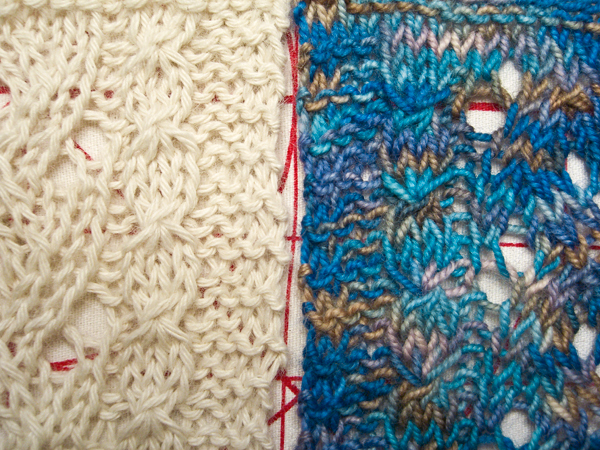 I have two sweaters knit with Noro, and both times I became annoyed at having to pick twigs and such from the fiber. And what’s with the knots? For what we pay for that yarn, can’t we have one continuous strand? 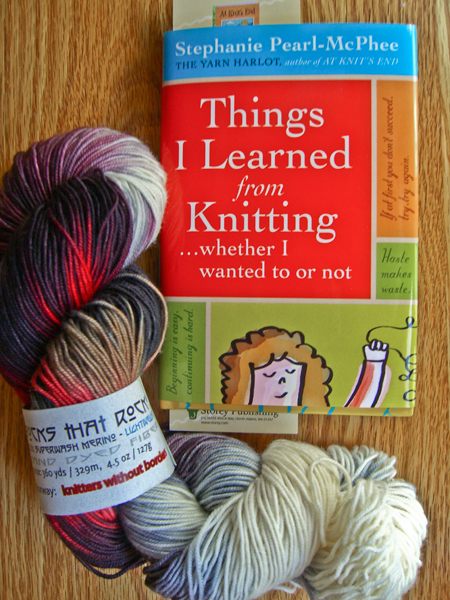 Especially since the strand after the knot always starts with some totally random color, leaving the poor knitter to decide whether to ruin the flow of the stripes in the finished object, or buy more yarn in the hope of matching. 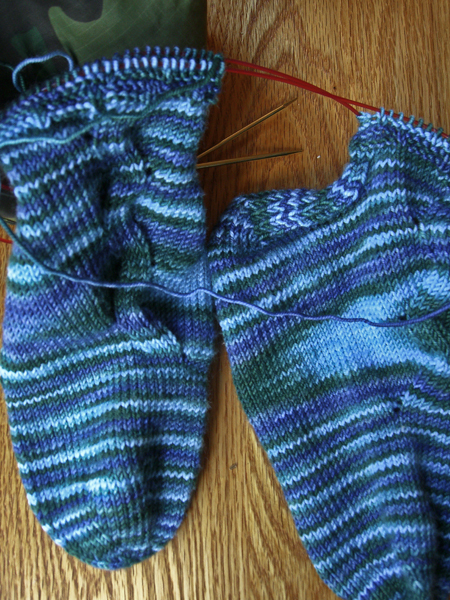 I’d felt some of the new sock yarn, and it seems so stiff and scratchy. Not fun to knit with. 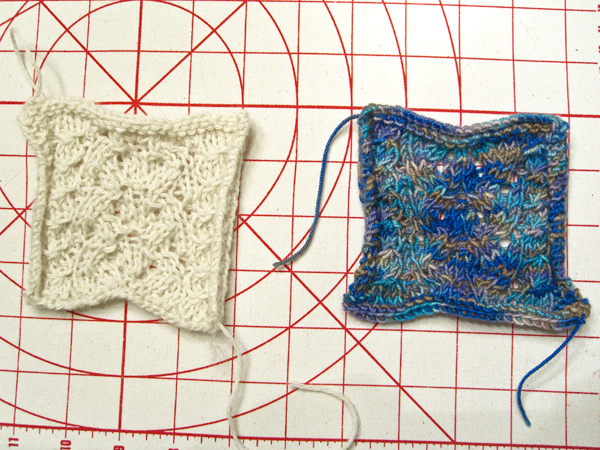 I just didn’t have much desire to knit with Noro sock yarn, and had said so. But the colors were so pretty. From Knit Knot Studio we hopped on the streetcar, which conveniently stops right in front of Knit Purl. At Knit Purl, a skein of JitterBug leaped off the display and into my arms and demanded to be taken home. The color was so pretty. Then I saw a really lovely colorway of Lorna’s Laces that I had never seen before. Teresa came over to say hello and laugh at my sock scarf. I’m not buying any sock yarn I told her, as I grabbed some Schaeffer Anne off the wall. The colors were so pretty. sock yarn? What sock yarn? L-to-R, bottom: Noro Kureyon Sock (the yarn I said I’d never buy) in S184, Schaeffer Anne in Toni Morrison. hmmmmm do you see some strong themes with these colorways? Well… the buttons aren’t sock yarn. 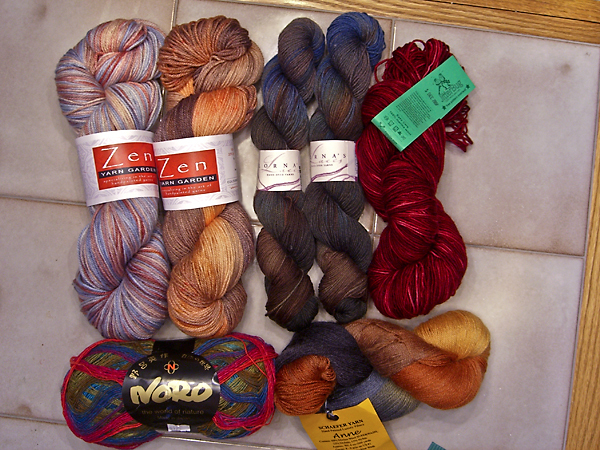 After At Knit Purl, I decided that maybe I’d done enough damage for the days. Leaving the Seattle knitters to their fate (I believe a spin through Powell’s Books was in their near future), we headed over to Starbuck’s for a cuppa and a slice of pumpkin bread. 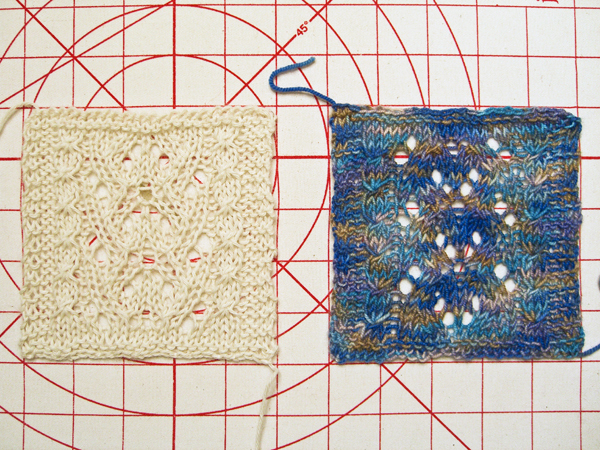 In the picture, you can see that we whipped the knitting out again while comparing hauls. On the chair, you can see The Wings Of A Dream in a glob by my purse. I had just messed up by forgetting a whole row with beads. But all was fixed. 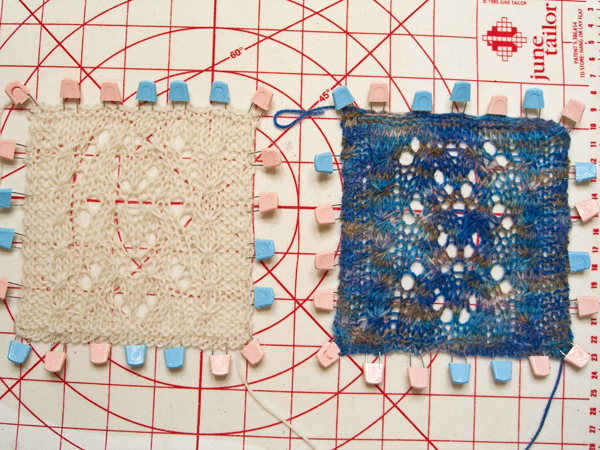 I have finished the first wing and started on the second wing. I’m still hoping to complete it in the next couple of weeks. We shall see. I had a great time on the crawl, despite the damage to my pocket book. 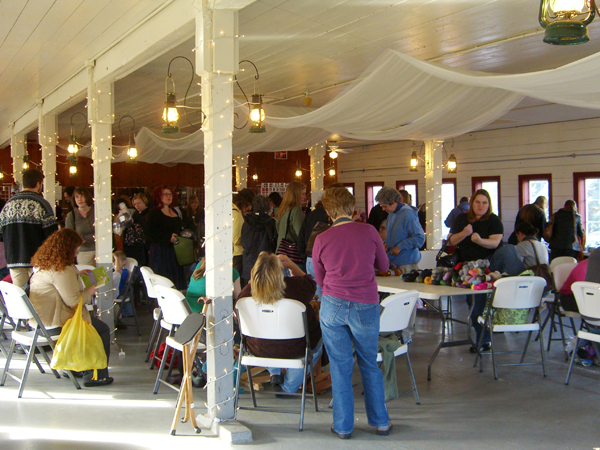 It was great fun getting to meet all of our northern knit-buds. I hope they crawl down this way again! Kat tagged me for this meme. So here are the answers to 38 things about me that you may or may not want to know. 1. Name one person who made you laugh last night? Linda at Tangle Thursday Knit Night, who shares my abiding fondness for blaring Jethro Tull on the car stereo. 2. What were you doing at 0800? Working. Fortunately I sometimes get to work from home. 3. What were you doing 30 minutes ago? Working. See above. 4. What happened to you in 2006? At the beginning of 2006 there was the first publication of Judy’s Magic Cast-On. And #1 Son moved away from home. I don’t thing there’s any relation between those two things. They’re just both significant. 6. How many beverages did you have today? Three cups of coffee and two glasses of water. 7. What color is your hairbrush? Red. 8. What was the last thing you paid for? Lunch yesterday — a turkey burger and fries. 9. Where were you last night? Tangle for Thursday Knit Night until 9:00, then home. 10. What color is your front door? White. Boring, maybe, but nicely set off by the dark gray-green siding. 11. Where do you keep your change? In an antique post office box that has been turned into a penny bank. 12. Whatâ€™s the weather like today? 50’s. Foggy this morning and now drizzly. 13. Whatâ€™s the best ice-cream flavor? Butter Brickle. Unfortunately no longer available. Cherry Garcia runs a distant second. 14. What excites you? Knitting! Fiber! Friends! Kids! Books! Work! (yes, really) Turning leaves! Blue skies! Life! 15. Do you want to cut your hair? No. But it could stand a little trim. 16. Are you over the age of 25? Oh, my! That was long, long ago! 17. Do you talk a lot? Sometimes too much. Other times not enough. 18. Do you watch the O.C.? Never have. 19. Do you know anyone named Steven? Yes, several Stevens and Stephens. 20. Do you make up your own words? Of course! What would be the fun in using the same old ones all the time? 21. Are you a jealous person? Not usually. But sometimes. I try to get over it quickly. 22. Name a friend whose name starts with the letter â€˜Aâ€™. Alice. 23. Name a friend whose name starts with the letter â€˜Kâ€™. Karen. 24. Whoâ€™s the first person on your received call list? #1 Son. 26. Do you chew on your straw? No. But I eat my ice. 27. Do you have curly hair? Mostly yes. Except for that one recalcitrant straight lock. 28. Whereâ€™s the next place youâ€™re going to? 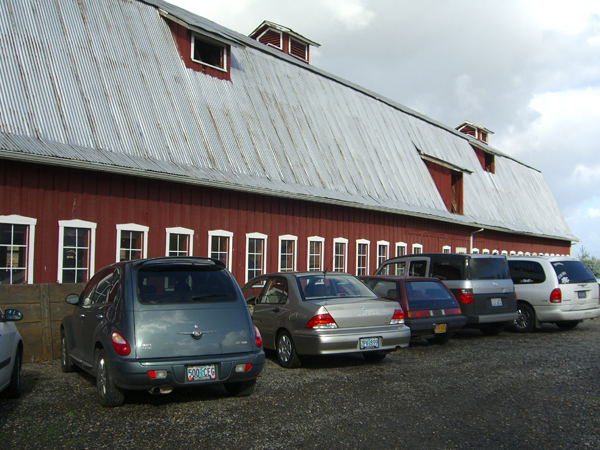 The Blue Moon barn sale! 29. Whoâ€™s the rudest person in your life? There are very few rude people in my life. I can think of one. But I will not name that person. 31. Will you get married in the future? I don’t plan on marrying again. Once was enough. 33. Is there anyone you like right now? I like lots of people. I don’t have any romantic designs, if that’s what you’re asking. 34. When was the last time you did the dishes? This morning. 36. Did you cry today? No. Not planning to unless I watch a sad movie tonight. 37. Why did you answer and post this? Because Kat tagged me and it was a slow blogging day since I’m still slogging away on The Great Green Glob. 38. Tag 5 people who would do this survey. I’m tagging a random (very, very random) five out of the whole long list of amazing PDX Knit Bloggers. Gentle reader, you should visit these fine fiberistas!